It's time. Hurricane season is coming, so all the cruisers are making their move. Some of our friends are headed south to El Salvador, others are making the jump to the South Pacific or heading back north via the long passage to Hawaii. And we are heading north. Against the prevailing winds and currents, against prevailing opinion, we're going to be "bashing" all the way home. 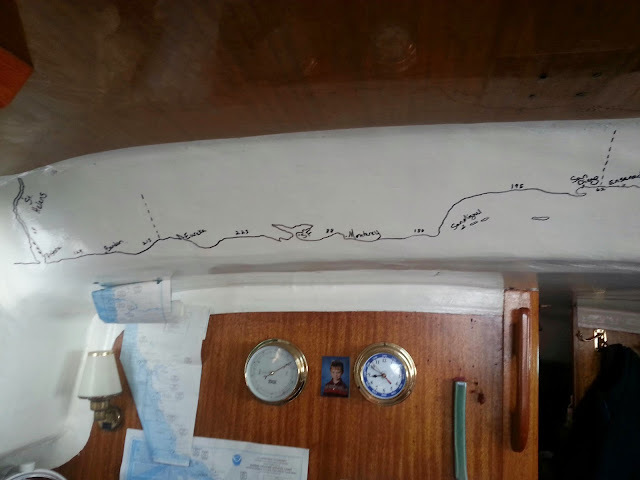 Bryan hypothesized that it was the delivery captains who started calling this route "the bash" in hopes of drumming up more business from fearful sailors and, just a couple of weeks ago, we heard a story that indicates he might not be too far off the mark. Everything we've heard from people who've actually done the trip gives us more confidence that our plan is sound. We've dealt with headwinds and currents, high winds and big seas before. We know the boat can handle it (maybe even better than the crew). And we have plenty of time to wait for good weather to make the trip as easy as possible. Still, we've been a little apprehensive about the many, many miles we need to cover and all the potentially difficult capes to round. So we've been trying to break the trip up into manageable chunks. We plotted out 13 legs of 200 miles, roughly 48 hours. Some legs are a little bit long--Bahia Tortugas to Ensenada is almost 300. Others are significantly shorter--Astoria to St. Helens will be a breeze at +/- 70 miles. Then, to help us visualize our plan, Bryan drew it on the wall. The map is stylized, and not quite to scale. But it gives us a beautiful representation of where we've been and where we're going. We plan to stop in between most of these ports along the way. And we wouldn't be surprised if we missed one or more of these in favor of another port that ended up more convenient or attractive in the moment. But this helps us to pace ourselves and watch our progress. The girls even made a tiny boat symbol as well as a (very much not-to-scale) house on the other end. On our passage from Isla Isabel to Mazatlan, the last portion of our first leg, I glanced up and more than once, saw that the little boat had been moved a little closer to our destination dot. Many people opt to head back to the Pacific NW via Hawaii. 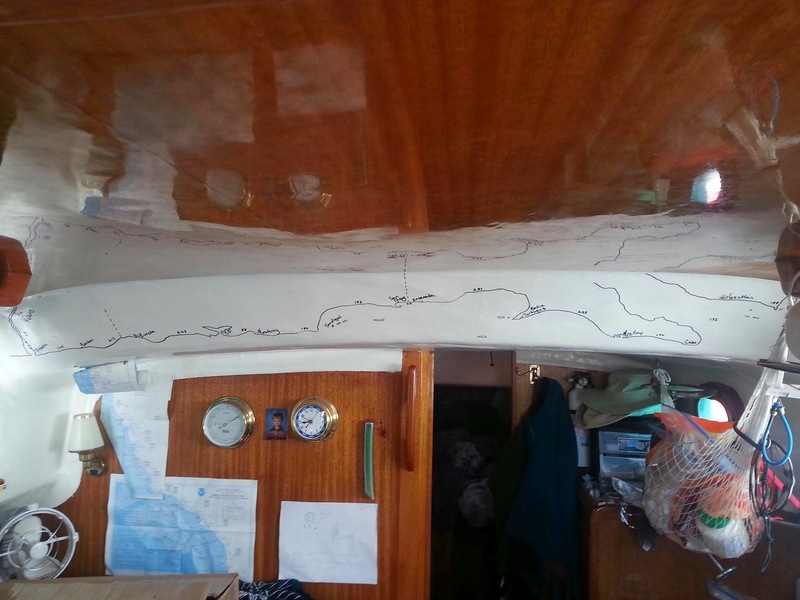 The winds and currents are often much easier on boat and crew, though of course, there are more miles to cover. But we have pretty limited water and fuel supplies and don't think that is a safe option for us. Besides, we made friends in many ports along the way and are really looking forward to visiting them again on the way back. And we expect to meet up with family a time or 2 along the way too, something that wouldn't be at all feasible in the middle of the Pacific. We've added some fuel tanks on deck for the long days of motoring and have put in a stock of good watch snacks to entice the whole crew to be excited about watches. We have a new watch schedule that makes better use of the energy of the young people we have aboard. And, since we expect the "bash" to be difficult, every day in which we can sail, every day that's not miserable, feels like a win. 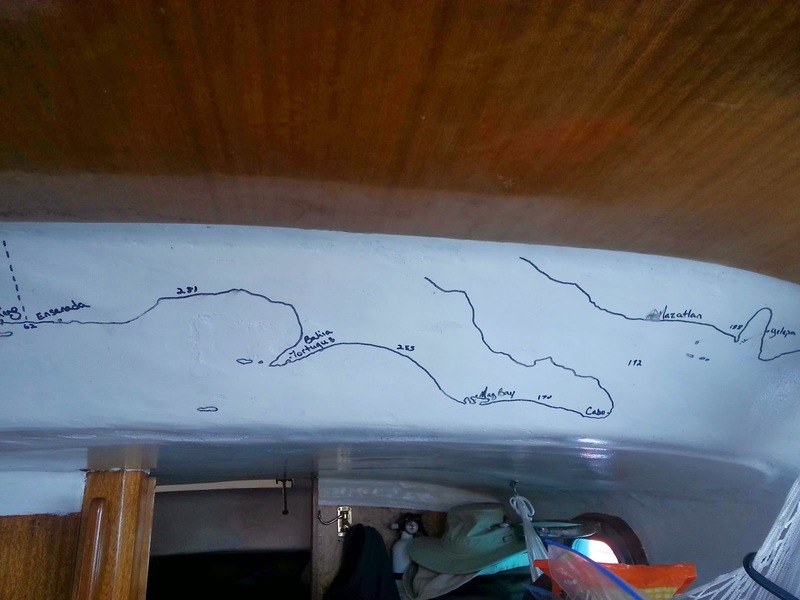 Leg 5-Bahia Tortugas to Ensenada- 281 miles Here we may detour out to Isla Guadalupe, the westernmost point in Mexico. It would add about 100 miles, about 24 hours to our journey, but if the winds are up, it would be considerably more comfortable to reach out and back again instead of beating into the wind and waves on a stubborn rhumb-line course. Leg 6-Ensenada to San Diego-62 miles!!! If all my numbers are accurate (I'm off the boat and away from my charts, so I'm not double checking) that's 2237 miles. That number seems impossible. But we plan to leave this afternoon for the first part of Leg 2, 150 miles or so across to the Baja peninsula. Before I know it, we'll be halfway...then 3/4s...then home. Our first trip to La Cruz de Huanacaxtle, we spent a lot of our time at the La Cruz Inn, where Michele and Trina stayed. We didn’t really explore the town and felt completely overwhelmed by the calendar of cruisers’ events we were handed when we checked into the marina. But this time around, we knew we’d be in town for a week or 2…or 3 or 4. So our goal for our first full day in La Cruz was to walk around and see what we could see. We ran into David and Carolyn first thing, and took off for town together. They’d only been in town a day when we pulled into the small boat dock just a few slips away from CrazyLove (and right next to our mutual friend Will from Thallasea. Remember Will and his errant dinghy? Remember Will and the lovely Christmas celebration?) But they’d already scoped out a cheap taco stand that sold rotisserie chickens and fried taquitos. We walked through town, past the roundabout with the town’s eponymous cross (made of Hunacaxtle wood), and up to Tu Pollo on the corner of the main highway. We got fried tacos, bags of rice and salsa, and delicious potatoes (see them roasting there underneath the dripping chicken fat? Oh, yes!) for all 5 of us for about $7.50 USD. David and Carolyn dug into their order on the spot and immediately went back for more. We picked up some drinks at a local “mini-super” and walked back to the main plaza to eat. We found some shade in the gazebo and dug into our meal under the watchful eye of the local iguana population. We spent the rest of the afternoon walking the cobblestone streets around town. We eventually stumbled across an lovely oasis called The Octopus’ Garden. It’s part restaurant/bar/coffee shop, part art gallery/T-shirt printing shop with live music several days a week, a dance floor upstairs, and a wood shop out back. We walked through the quiet courtyard and found our way to the Huichol Art Gallery at the back. The owners work closely with indigenous people from the area to market their colorful yarn and bead artwork and reproduce several designs on bright T-shirts to help spread the traditional artwork more broadly. After a few minutes, several kids burst in and dashed up the stairs. A little curious, we followed them up and found a young Canadian woman teaching an aerial silks class to a mix of locals and cruisers’ kids. She flipped deftly between English and Spanish and just as adeptly, flipped up and down the hanging silk. I pulled up a chair next to one of the local moms and we easily found connections between our busy lives. She said, “I’d love to learn English, and they offer classes here, but by the time we get home from school and eat something…there’s just no time." Evening found us at "The Twins," a taco stand near La Cruz's main plaza. This small street restaurant had opened just a few days before we arrived in town. Over the next few weeks, it was fun to watch the owners add menu items and equipment as they could. First, they added napkin holders, then salsa bowls for each table, and one proud day, they owner called Bryan over to witness the installation of an Al Pastor rotisserie. They learned our names and joked with Meira about her insatiable appetite. We met some of their 8 kids (including the 3-year-old twins) We affectionately nicknamed the place "Tacos on the Square," "White Tent Tacos," or eventually, Alejandra and Leno's place. 10 peso tacos and new Mexican friends--now we're talking!